L’histoire des Flamin’ Groovies commence en 1965 à San Francisco, sous le nom des » Chosen Few » . Après un changement de nom et la sortie d’un disque autoroduit » Sneakers » , le groupe attire l’attention de Columbia Records, qui les signe et sort leur premier album » Supersnazz » sur le label Epic . Les deux suivants sortent sur le label Kama Sutra : » Flamingo » et » Teenage Head » ( la référence ! ) . Le chanteur Roy Loney quitte le groupe : il est remplacé par Chris Wilson ( de Loose Gravel ) . Ils continuent leur carrière en Angleterre , toujours dans le même style mais avec des influences beaucoup plus sixties . Au début des années 70, ils sortent plusieurs singles sur United Artists, enregistrés aux mythiques studios Rockfield ( Pays de Galles ) avec Dave Edmunds à la production . En 1976, ils signent avec Sire Records qui sort les trois joyaux power pop : » Shake some action « , » Flamin’Groovies now » et » Jumpin’ in the night » . Un nouveau changement de line up fait suite au départ de Wilson pour rejoindre The Barracudas . Les Groovies continuent de tourner en Australie et en Europe durant les années 80 et sortent un album souvent négligé, » Rock Juice » ; avant de prendre des voies différentes : Jordan crée un nouveau groupe » Magic Christian » tandis que Wilson sort des albums en solo en Europe . En 2013, Jordan, Wilson et le premier bassiste George Alexander sont réunis pour la première fois depuis 1981 . Ils sont accompagné du batteur Victor Penalosa, qui ajoute sa patte tout en gardant le son des anciens albums . Le quatuor est retourné aux studios pour enregistrer des nouveaux morceaux et peaufiner d’anciens titres inachevés . Ils ont récemment tourné au Japon, en Australie, aux USA , à Londres ainsi qu’au Rock & Roll Hall of Fame . Les fans sont ravis de découvrir » une set list de rêves » avec des titres originaux, jamais joués sur scène . 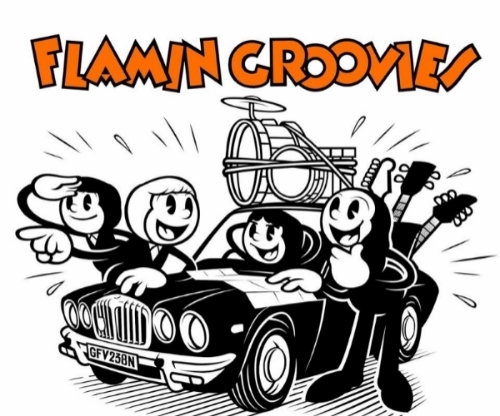 The Flamin’ Groovies story goes all the way back to 1965 when the band began as the Chosen Few in their hometown of San Francisco, California . After a name change and a self-released 10-inch album called Sneakers, which sold amazingly well, the band caught the attention of Columbia Records, who signed them and released their first real album, Supersnazz, on the Epic label . Their next two albums were released on the Kama Sutra label : Flamingo, and the now revered classic Teenage Head . Lead singer Roy Loney then left the band and lead guitarist Cyril Jordan moved the group to England, with Chris Wilson (formerly of Loose Gravel) taking over as front man . They continued their style of straight-ahead guitar-driven rock n’ roll but this time with a more 60’s rather than 50’s influence . A few singles on United Artists, recorded at the legendary Rockfield Studios in Wales with Dave Edmunds producing, followed in the early ’70s . In ’76 they signed to Sire Records, who released three true gems of power pop : Shake Some Action, Flamin’Groovies Now, andJumpin’ In The Night .Les fans sont ravis de découvrir » une set list de rêves » avec des titres originaux, jamais joués sur scène . Another lineup change ensued in the next decade with Wilson moving to England and joining the Barracudas . The Groovies continued on through the 80’s and into the early ’90s touring Australia and Europe, putting out a fine but overlooked album called Rock Juice and then finally calling it quits . Jordan formed a new band called Magic Christian while Wilson released solo albums in Europe . In 2013, Jordan, Wilson and original founding member and bass player George Alexander reunited for the first time since 1981 . They’ve added drummer Victor Penalosa, who faithfully recreates the style heard on the classic recordings, while at the same time adding his own flavor . The foursome has gone into the studio to record brand new material as well as finish up some long lost recordings . They recently toured Japan, Australia, London, and the U.S., and performed at the Rock & Roll Hall of Fame . Fans have been delighted with what is being called « a dream set list, » including original songs the band has never performed before onstage .